1. Passarge E. Color Atlas of Genetics. 2nd ed. Stuttgart: Thieme; 2001. 2. Willets N. Plasmids. In Scaife DLJ, Galizzi A, eds. Genetics of Bacteria. London: Academic Press; 1985:165-195. 3. Hewitt WL. Penicillin-historical impact on infection control. Ann N Y Acad Sci. 1967;145:212-215. 4. Livermore DM. Antibiotic resistance in staphylococci. Int J Antimi-crob Agents. 2000;16(suppl 1):S3-S10. 5. Crick JWJF. A structure for deoxyribonucleic acid. Nature. 1953;171: 737. 6. Breslauer KJ, Frank R, Blocker H, Marky LA. Predicting DNA duplex stability from the base sequence. Proc Natl Acad Sci U S A. 1986; 83:3746-3750. 7. Freier SM, Kierzek R, Jaeger JA, et al. Improved free-energy parameters for predictions of RNA duplex stability. Proc Natl Acad Sci U S A. 1986;83:9373-9377. 8. Lewis ME, Arentzen R, Baldino F Jr. Rapid, high-resolution in situ hybridization histochemistry with radioiodinated synthetic oligonucleotides. J Neurosci Res. 1986;16:117-124. 9. Felsenfeld G, Groudine M. Controlling the double helix. Nature. 2003;421:448-453. 10. Preston BD, Poiesz BJ, Loeb LA. Fidelity of HIV-1 reverse transcriptase. Science. 1988;242:1168-1171. 11. Roberts JD, Bebenek K, Kunkel TA. The accuracy of reverse transcriptase from HIV-1. Science. 1988;242:1171-1173. 12. Kochetov AV, Ischenko IV, Vorobiev DG, et al. Eukaryotic mRNAs encoding abundant and scarce proteins are statistically dissimilar in many structural features. FEBS Lett. 1998;440:351-355. 13. Gotoh O. Homology-based gene structure prediction: simplified matching algorithm using a translated codon (tron) and improved accuracy by allowing for long gaps. Bioinformatics. 2000;16:190-202. 14. Olivier M, Aggarwal A, Allen J, et al. A high-resolution radiation hybrid map of the human genome draft sequence. Science. 2001;291:1298-1302. 15. McCaughan KK, Brown CM, Dalphin ME, Berry MJ, Tate WP. Trans-lational termination efficiency in mammals is influenced by the base following the stop codon. Proc Natl Acad Sci USA. 1995;92: 5431-5435. 16. Frischmeyer PA, Dietz HC. Nonsense-mediated mRNA decay in health and disease. Hum Mol Genet. 1999;8:1893-1900. 17. Wilkinson MF, Shyu AB. Multifunctional regulatory proteins that control gene expression in both the nucleus and the cytoplasm. Bioessays. 2001;23:775-787. 18. Bruno C, Lofberg M, Tamburino L, et al. Molecular characterization of McArdle's disease in two large Finnish families. J Neurol Sci. 1999;165:121-125. 19. Hou VC, Conboy JG. Regulation of alternative pre-mRNA splicing during erythroid differentiation. Curr Opin Hematol. 2001;8:74-79. 20. Lipes J, Skamene E, Newkirk MM. The genotype of mice influences the autoimmune response to spliceosome proteins induced by cytomegalovirus gB immunization. Clin Exp Immunol. 2002;129: 19-26. 21. Seidl R, Labudova O, Krapfenbauer K, et al. Deficient brain snRNP70K in patients with Down syndrome. Electrophoresis. 2001; 22:43-48. 22. Wehner KA, Ayala L, Kim Y, et al. Survival motor neuron protein in the nucleolus of mammalian neurons. Brain Res. 2002;945:160-173. 23. Garzon D, Yu G, Fahnestock M. A new brain-derived neurotrophic factor transcript and decrease in brain-derived neurotrophic factor transcripts 1,2 and 3 in Alzheimer's disease parietal cortex. J Neuro-chem. 2002;82:1058-1064. 24. Sakata N, Yamazaki K, Kogure T, Mukai T. Alternative splicing of Rh blood group polypeptide mRNA produces a novel transcript containing a short nucleotide insertion on human erythroleukemia K562 cells. Cell Biol Int. 2001;25:697-703. 25. Liu X, et al. Partial correction of endogenous DeltaF508 CFTR in human cystic fibrosis airway epithelia by spliceosome-mediated RNA trans-splicing. Nat Biotechnol. 2002;20:47-52. 26. Phylactou LA, Darrah C, Wood MJ. Ribozyme-mediated trans-splicing of a trinucleotide repeat. Nat Genet. 1998;18:378-381. 27. Phylactou LA, Kilpatrick MW, Wood MJ. Ribozymes as therapeutic tools for genetic disease. Hum Mol Genet. 1998;7:1649-1653. 28. Lan N, Howrey RP, Lee SW, Smith CA, Sullenger BA. Ribozyme-mediated repair of sickle beta-globin mRNAs in erythrocyte precursors. Science. 1998;280:1593-1596. 29. Mansfield SG, Kole J, Puttaraju M, et al. Repair of CFTR mRNA by spliceosome-mediated RNA trans-splicing. Gene Ther. 2000;7:1885-1895. 30. 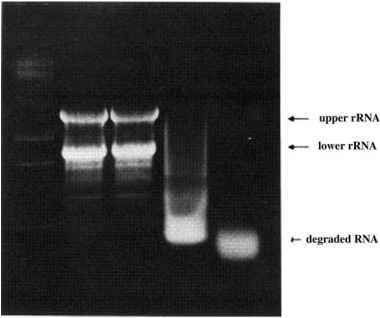 Urano Y,Watanabe K,Sakai M, Tamaoki T. The human albumin gene. Characterization of the 5' and 3' flanking regions and the polymorphic gene transcripts. J Biol Chem. 1986;261:3244-3251. 31. Lin B, Rommens JM, Graham RK, et al. Differential 3' polyadenyla-tion of the Huntington disease gene results in two mRNA species with variable tissue expression. Hum Mol Genet. 1993;2:1541-1545. 32. Boyd CD, Mariani TJ, Kim Y, Csiszar K. The size heterogeneity of human lysyl oxidase mRNA is due to alternate polyadenylation site and not alternate exon usage. Mol Biol Rep. 1995;21:95-103. 33. Gallie DR. Protein-protein interactions required during translation. Plant Mol Biol. 2002;50:949-970. 34. Chavatte L, Frolova L, Kisselev L, Favre A. The polypeptide chain release factor eRF1 specifically contacts the s(4)UGA stop codon located in the A site of eukaryotic ribosomes. Eur J Biochem. 2001;268:2896-2904. 35. Stratakis CA. Mutations of the gene encoding the protein kinase A type I-alpha regulatory subunit (PRKAR1A) in patients with the "complex of spotty skin pigmentation, myxomas, endocrine overactivity, and schwannomas" (Carney complex). Ann N Y Acad Sci. 2002;968:3-21. 36. Valentine CR. The association of nonsense codons with exon skipping. Mutat Res. 1998;411:87-117. 37. Cline J, Braman JC, Hogrefe HH. PCR fidelity of pfu DNA polymerase and other thermostable DNA polymerases. Nucleic Acids Res. 1996; 24:3546-3551. 38. Maga G, Shevelev I, Ramadan K, Spadari S, Hubscher U. DNA poly-merase theta purified from human cells is a high-fidelity enzyme. J Mol Biol. 2002;319:359-369. 39. Kuchta RD, Cowart M, Allen D, Benkovic SJ. Kinetic and structural investigations of the replicative fidelity of the Klenow fragment. Biochem Soc Trans. 1988;16:947-949.